Many of us fantasize about living in the future. But at Japan’s Mitsubishi Hitachi Tool Engineering, Ltd., Kazuyuki Kubota, Head of Manufacturing Department and Head of Coating Technology, actually works in the future. This isn’t science fiction. He hasn’t mastered the art of time travel. But when it comes to coating systems and technology, Kubota never stops anticipating the next breakthrough in requirements, capabilities and performance. Unstoppable innovator: Kazuyuki Kubota from Mitsubishi Hitachi Tool Engineering. To put it another way: the pace of change is so rapid these days that it’s no longer possible to use state of the art technology — only technology that’s state of the art for now. Each advance establishes the foundation for the next one. And customers like Kubota drive the Oerlikon Balzers team to work continuously on being first to market with what’s next. 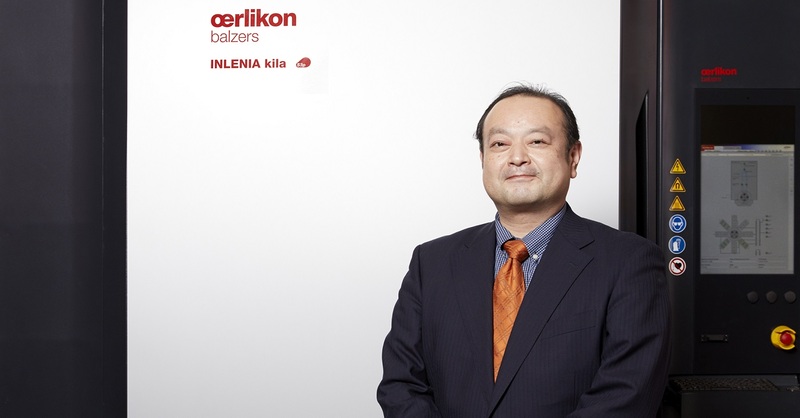 More than a decade ago, during development of the new Arc technology, Oerlikon Balzers introduced the INNOVA system, which enabled Kubota’s team to reduce the time required to develop and manufacture many new coatings and products. Most recently, Mitsubishi Hitachi purchased the latest advance, INLENIA, a line of coating systems that Oerlikon Balzers designed for ultra-smooth surfaces. The solution attracted Kubota’s interest because of benefits such as making customization possible thanks to the precise, independent scalability of pulse duration, shape, and density. This represents a significant advance beyond conventional HiPIMS (high-power impulse magnetron sputtering). It’s a search that shows no sign of ending — because every time these partners achieve an objective, they ask themselves what new challenge they can take on. Of course, the engineers at Oerlikon Balzers have an internal drive to build on their record of breakthroughs. But there’s something empowering and inspiring about having a customer who’s always wondering what can be done to improve current products and solutions. It is through collaboration with clients such as Kazuyuki Kubota and his team at Mitsubishi Hitachi Tool Engineering that Oerlikon Balzers optimizes its capacity for exploring each successive advance in coating systems and exploiting the full potential of these technologies. And that’s what “working in the future” is all about. Find out more about the coating systems INLENIA kila and INLENIA pica!